Complex regional pain syndrome (CRPS) is a term for a variety of clinical conditions characterised by chronic persistent pain and are subdivided into Type I and Type II CRPS. It is a condition that can develop after a limb trauma  and appears mostly in one or more limbs. CRPS can be considered a regional post-traumatic neuropathic pain problem, and like other neuropathic pain disorders, symptoms are a disproportionate consequence of painful trauma or nerve lesion. Many names have been used to describe this syndrome such as; Reflex Sympathetic Dystrophy, causalgia, algodystrophy, Sudeck’s atrophy, neurodystrophy and post-traumatic dystrophy. To standardise the nomenclature, the name complex regional pain syndrome was adopted in 1995 by the International Association for the Study of Pain (IASP). CRPS affects approximately 26 out of every 100,000 people. It is more common in females than males, with a ratio of 3.5:1. CRPS can affect people of all ages, including children as young as three years old and adults as old as 75 years, but typically is most prevalent in the mid-thirties. CRPS Type I occurs in 5% of all traumatic injuries, with 91% of all CRPS cases occurring after surgery. CRPS can happen in any body part, but occurs most often in the extremities. The wrist is most frequently affected after distal radial fractures. The central and peripheral nervous systems are connected through neural and chemical pathways, and can have direct control over the autonomic nervous system. It is for this reason that there can be changes in vasomotor and sudomotor responses without any impairment in the peripheral nervous system. Pain, heat, and swelling are usually not located at the site of injury and there may be no clear damage. Central sensitisation is seen as a main cause for developing CRPS. Figure 1. 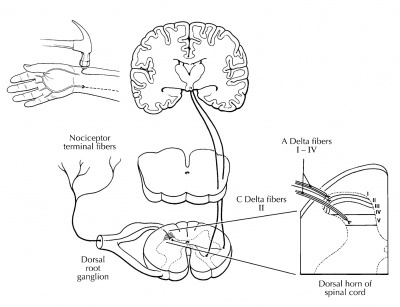 Nociceptive (painful) information is relayed through the dorsal horn of the spinal cord for processing and modulation before cortical evaluation. Sometimes the provoking injury can occur spontaneously or can not be determined. One study found that 56% of patients felt their CRPS was due to an ‘on the job’ injury, with the most common type of work related injury occurring in service employments, such as in restaurants, bakeries, and police offices. The location of CRPS varies from person to person, often affecting the extremities, occurring slightly more in the lower extremities (+/- 60%) than in the upper extremities (+/- 40%). It can also appear unilaterally or bilatearally  and as mentioned above, occurs regularly in young adults and is more frequent in females than males. The onset is mostly associated with a trauma, immobilisation, injections, or surgery, but there is no relation between the grade of severity of the initial injury and the following syndrome. A stressful life and other psychological factors may be potential risk factors that impact the severity of symptoms in CRPS. The differences between Type I and Type II are based on a consensus between clinicians and scientists. The definition of Type II (see below) is open to interprtation. For example, post-traumatic neuralgia has different syndromes with different underlying mechanisms, but it can be included in type II. Hence the definition of both types needs to be improved. In both cases, it can be assumed that long-term central changes have occurred. Changes in the somatosensory, sympathetic, peripheral, somatomotor, and neuroendocrine systems can cause changes in the central nervous system. All symptoms of CRPS II show many similarities to those of CRPS I.
CRPS is clinically characterised by sensory, autonomic, and motor disturbances. The table below shows an overview of the different characteristics of CRPS I and II. Formerly "Reflex Sympathetic Dystrophy (RSD) "
Symptoms can spread beyond the area of the lesioned nerve in Type II. Ongoing neurogenic inflammation, vasomotor dysfunction, central sensitisation and maladaptive neuroplasticity contribute to the clinical phenotype of CRPS. Genetic and psychological factors can influence the vulnerability to CRPS and also affect the mechanisms that maintain CRPS. Peripheral and central changes can be irreversible. The sympathetic nervous system plays a key role in maintaining pain and autonomic dysfunction in the affected extremity. Patients typically progress through three stages as CRPS develops. CRPS in children does not always follow the same stage patterns and may only slowly improve or, at times, even stagnate. ● No other illness could explain the set of symptoms the patient is presenting with. CRPS diagnosis is mainly based on patient history, clinical examination, and supportive investigations. A triple phase bone scan is the best method to rule out Type I CPRS . The triple-phase bone scan has the best sensitivity, NPV, and PPV compared to MRI and plain film radiographs. Infrared thermography (IRT) is an effective mechanism to find significant asymmetry in temperature between both limbs by determining if the affected side of the body shows vasomotor differences in comparison to the other side. It is reported having a sensitivity of 93% and a specificity of 89%. This test is hard to obtain so it is not often used for diagnosing of CRPS. Determining if the patient sweats abnormally. Q-sweat is an adequate instrument to measure sweat production. The sweat samples should be taken from both sides of the body at the same time. Irregularities in the bone structure of the affected side of the body can become visible with the use of X-rays. If the X-ray shows no sign of osteoporosis, CRPS can be excluded if the patient is an adult. With the use of technetium Tc 99m-labeled bisophosphonates an increase in bone metabolism can be shown. Higher uptake of the substance means increased bone metabolism and the body part could be affected. An affected limb often shows less bone mineral density and a change in the content of the bone mineral. During treatment of the CPRS the state of the bone mineral will improve. So this test can also be used to determine if the patient’s treatment is effective. MRIs are useful to detect periarticular marrow edema, soft tissue swelling and joint effusions. And in a later stage atrophy and fibrosis of periarticular structures can be detected. But these symptoms are not exclusively signs of CRPS. If the patient shows vasomotor or sudomotor dysfunction and severe pain, blocking the sympathetic nerves proves to be an effective technique to evaluate if the sympathetic nervous system is causing the pain to remain. This technique requires local anesthetic or ablation and is successful if at least 50% of the pain is reduced. There are several methods to evaluate CRPS. Each symptom has another test to evaluate its severity. Below is a list of the different types of instruments with their evaluated symptoms. There is also the CPRS Severity Score (CSS). It includes signs and symptoms that reflect the sensory, vasomotor, sudomotor/edema and motor/trophic disorders of CPRS. This scoring list evaluates CRPS symptoms separately in order to develop a self-monitoring tool for patients. It is anticipated that this tool will help to facilitate disease management and improve dialogue between patients and their medical team. Eight symptoms are evaluated at the baseline visit with self-reported ratings of worst pain in the affected area, disability, depression, and quality of life (SF-36). The distal ends of the extremities require attention when examining a patient with CRPS. However, common findings of regional neuropathic and motor dysfunction have shown us that it is important to broaden the examination both proximally and contralaterally. Light touch, pinprick, temperature and vibration sensation should be assessed for a complete picture of the CRPS. Most assessments are interlinked, for example, when vibration sensation is highly positive, light touch should also be positive. To help distinguish the findings of a sensory dysfunction, bilateral comparisons are made. The results should be clear and reliable. Oral pain relieving medications including corticosteroids and NSAIDs, as well as acupuncture, provide effective pain relief in approximately 20% of those with CRPS, but this is supported by weak evidence. Treatments may be geared to helping patients manage symptoms. Amitriptyline relieves depression and acts as a sleeping aid. Calcium channel blockers can help to improve circulation through SNS effect. Intrathecal baclofen, among other measures, improves motor dystonia. A scorelist (based on pain, daily activities, edema, color, and ROM) showed greater improvement by dimethyl sulfoxide treatment. DMSO seems to provide a mild improvement in range of motion and vasomotor instability in patients with CRPS. Due to the inflammatory response seen in CRPS, steroids have been used and resulted in significant improvements in pain, oedema and a better post treatment score. Intravenous immunoglobulin can reduce pain in refractory CRPS. Low doses of ketamine infusion has been shown to decrease pain in patients with CRPS type I who had been unsuccessful with other conservative methods of management. Ketamine blocks central sensitization by effecting the N-methyl-D-aspartate receptor which has been shown to be effected in CRPS. Antidepressants may be utilised to treat associated depression. Use of surgical and chemical sympathectomy show moderate improvement in pain scores in patients with CRPS. There were no significant differences found between the surgical and chemical groups when comparing pain scores from day one to four months. More high quality research needs to be done before recommending this as a first line of defence. High frequency repetitive transcranial magnetic stimulation on the motor cortex in addition to pharmacological management was effective in reducing pain. This was demonstrated by the scores on the McGill Pain Questionnaire and Short Form-36 which include different aspects of pain such as sensory-discriminative and emotional-affective. Surgery, casts, and ice should be avoided when treating CRPS because they further aggravate the nervous system. Surgery leads to further stress, inflammation, and immune system disturbances. A stellate ganglion block, or sympathectomy, blocks the nerve pathways causing pain. This may be most beneficial in the early stages of CRPS. Clodronate: less pain, improved global assessment and higher perceived efficacy (patient self evaluated). Palmidronate: less pain, higher overall improvement (patient self reported), and higher functional assessment scores. It is difficult to manage CRPS as there is lack of understanding of the pathophysiologic abnormalities, a lack of specific diagnostic criteria and very low quality evidence to treat CRPS. The main goals of treatment are a reduction in pain, preservation of limb function and a return to work. Comorbidities such as depression, sleep disturbance and anxiety also need to be addressed and treated concurrently in a patient centred, multidisciplinary approach. A combination of physical and occupational therapy are effective in reducing pain and increasing function in patients who have had CRPS for less than 1 year . Physical therapy focuses on patient education about the condition and functional activities. Aquatic therapy allows activities to be performed with decreased weight bearing on the lower extremities. It is important to recognise that CRPS typically follows blood vessel pathways, and therefore symptoms may not always follow neural patterns. As a result of the spread pattern, CRPS treatment should also be provided bilaterally, due to the contralateral connections present between the extremities. Treatment should be based on basic principles of pain management (pain and symptom relief, supportive care, rehabilitation) and due to the lack of evidence in treatment of CRPS treatments are based around that of other neuropathic pain syndromes. Immobilisation and contralateral therapy. Intensive active therapy in the acute phase can lead to deterioration. Passive physical therapy including manipulation, manual therapy , massage  and mobilisations. Lymphatic drainage can be used to facilitate regression of oedema. Tender areas are recommended to be treated in the following order: more severe before less severe, more proximal and medial before more distally and laterally located points and the area of greatest accumulation of tender areas is treated first. When tender areas are located in a row, the middle is treated first. Therapeutic exercise includes isometric strengthening therapy followed by active isotonic training in combination with sensory desensitisation programmes. Strength training includes exercises for all four extremities and the trunk. Desensitisation programmes consist of giving stimuli of different fabrics, different pressures (light or deep), vibration, tapping, heat or cold. The exercises can be stress-loading (i.e. walking, carrying weights), endurance training and functional training. When CRPS occurs in the lower extremities, gait re-training is recommended. Graded motor imagery/learning is effective. However, further trials are required   GMI plus medical management is more effective than medical management plus physiotherapy  GMI may reduce pain and improve function. Other therapies include relaxation,  cognitive-behavioral therapy,  deep breathing exercises and biofeedback. Complex regional pain syndrome in adults UK guidelines for diagnosis, referral and management in primary and secondary care. Royal College of Physicians, May 2012. CRPS is a term for a variety of clinical conditions characterised by chronic persistent pain. There are two types of CRPS and the difference between Types I and II is based on a consensus between clinicians and scientists. All symptoms of CRPS Type II show many similarities to those of CRPS I. It is difficult to manage CRPS as there is lack of understanding of the pathophysiologic abnormalities and lack of specific diagnostic criteria along with very low quality evidence to treat CRPS. Clinical studies demonstrate a significant improvement following physical therapy, but there needs to be more trials to develop an optimal management programme. ↑ 5.00 5.01 5.02 5.03 5.04 5.05 5.06 5.07 5.08 5.09 5.10 5.11 5.12 5.13 5.14 5.15 5.16 5.17 Goebel A. Complex regional pain syndrome in adults. Rheumatology 2011;50(10):1739-50. ↑ Turner-Stokes L, Goebel A. Complex regional pain syndrome in adults: concise guidance. Clinical Med 2011; 11(6):596-600. ↑ BARON, R., Complex regional pain syndromes. Curr Pain Headache Rep., 2001. ↑ SHIPTON, E., Complex regional pain syndrome – Mechanisms, diagnosis, and management. Current Anaesthesia and Critical Care, 2009. ↑ TEASDALL, R., Complex Regional Pain Syndrome (reflex sympathetic dystrophy). Clin Sports Med, 2004. ↑ 34.0 34.1 34.2 34.3 34.4 34.5 34.6 34.7 34.8 Hooshmand H, Phillips E. Spread of complex regional pain syndrome. Vero Beach, Florida. Neurological Associates Pain Management Center. ↑ 37.00 37.01 37.02 37.03 37.04 37.05 37.06 37.07 37.08 37.09 37.10 37.11 37.12 37.13 37.14 37.15 37.16 MD Guidelines, Medical DIsability Advisor. Complex Regional Pain Syndrome: Comorbid Conditions. http://www.mdguidelines.com/complex-regional-pain-syndrome/comorbid-conditions (accessed March 28, 2012). ↑ Cappello">Cappello Z, Kasdan M, Louis D. Meta-analysis of imaging techniques for the diagnosis of complex regional pain syndrome type I. JHS 2012;37A:288-296. ↑ Simpson E, Duenas A, Holmes M, Papaloannou D, Chilcott J. Spinal cord stimulation for chronic pain of neuropathic or ischaemic origin: systematic review and economic evaluation. Health Technology Assessment 2009;13(17):1-179. ↑ Olson GL, Meyerson BA, Linderoth B. Spinal cord stimulation in adolescents with complex regional pain syndrome type I. EUR J PAIN 2008;12(1):53-59. ↑ Perez R, Zuurmond W, Bezemer P, Kuik D, vanLoenen A, deLange J, et al. The treatment of complex regional pain syndrome type I with free radical scavengers: a randomized controlled study. Pain 2003;102(3):297-307. ↑ Goldberg M, Domsky R, Scaringe D, Hirsh R, Dotson J, Sharaf I, et al. Multi-Day Low Dose Ketamine Infusion for the Treatment of Complex Regional Pain Syndrome. Pain Physician 2005;8:175-179. ↑ Straube S, Derry S, Moore RA, McQuay HJ. Cervico-thoracic or lumbar sympathectomy for neuropathic pain and complex regional pain syndrome. Cochrane Database of Systematic Reviews 2010;7:1-14. ↑ Picarelli H, Teixeira M, deAndrade D, Myzkowski M, Luvisotto T, Yeng L, et al. Repetitive Transcranial Magnetic Stimulation Is Efficacious as an Add-On to Pharmacological Therapy in Complex Regional Pain Syndrome Type I. J Pain 2010;11(11):1203-10. ↑ Somers D, Clemente F. Transcutaneous Electrical Nerve Stimulation for the Management of Neuropathic Pain: The Effects of Frequency and Electrode Position on Prevention of Allodynia in a Rat Model of Complex Regional Pain Syndrome Type II. Phys Ther 2006;86:698-709.